So apparently medieval combat is now an international sport. A book was tagged with a unique identifier (a shelfmark) that was entered into a searchable database (a library catalogue), which could subsequently be consulted with a handheld device (a portable version of the catalogue). Yeah, but those things with two tails are just wrong. Fantasy doesn’t necessarily have to be historically accurate, but some tropes are so entrenched in Medieval-style fantasy that people come to mistake them for historical fact. What is based on real history and what is just a convincing fiction? The British Library has compiled a treasury of medieval images of dragons in honor of Saint George’s Day. 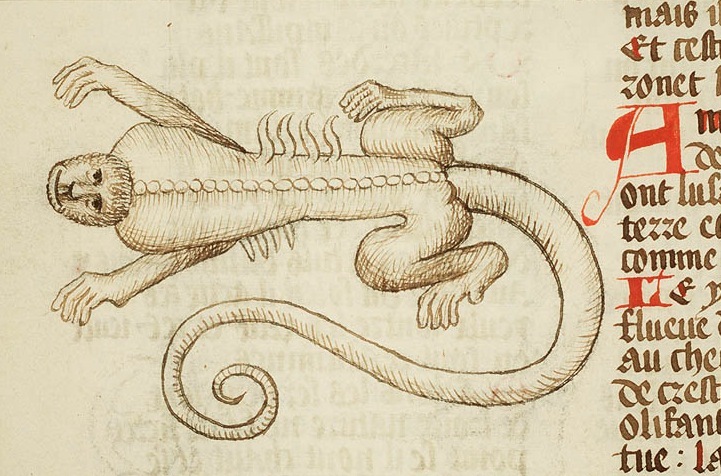 Dragons are near-ubiquitious in medieval manuscripts. They take pride of place in bestiaries and herbals, books of history and legend, and Apocalypse texts, to name a few. They serve as symbols, heraldic devices, and even as ‘just’ decoration, and their physical characteristics can vary widely. Cinematic and literary depictions of dragons today are fairly consistent; they are almost always shown as reptilian, winged, fire-breathing creatures (in a word, Smaug). But this was by no means a constant portrayal in the medieval period. What Kind of Armor Did Medieval Women Wear?